Do you have some great stuff lying around in your house that you no longer use? What about that Guitar that you purchased about an year ago and haven’t touched in months? What about your treadmill that’s gaining weight faster then you as its being used to store stuff these days? Well, instead of letting the dust settle on this stuff, you can now sell them to others easily. This will put your stuff to some use and at the same time get you some extra cash and space in the house. The same concept is applicable in reverse. If you want to buy something, then think if a used product will work fine. This will save you a lot of cash. Now the question is that what’s the best and reliable way to sell (and buy) used or new stuff online? The answer is OLX.IN. OLX is a great website where you can buy and sell online. You can even trade products online easily on OLX. OLX is accessible globally, which open the whole world to be your market. I know a person who is running an online business selling a specific product via OLX only. Also, if you are looking for something, the probability of you finding it increases many times as people from all over the globe listing stuff to sell online on OLX. 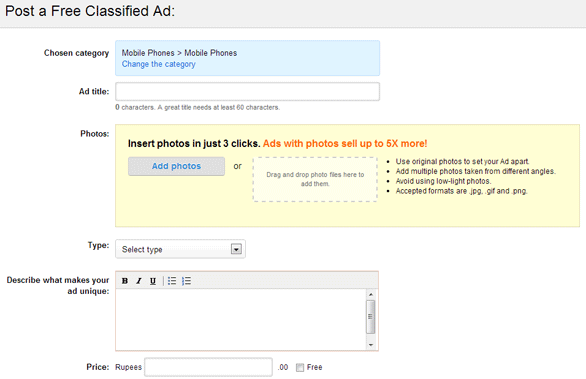 OLX is completely free, unlike websites such as eBay. This lets you list or buy unlimited product on OLX without worrying about a fee. There is a downside to this though. OLX doesn’t provide any escrow service to its users. So one should always do proper due diligence before completing a transaction via OLX. The most important thing about OLX is that you don’t need a computer to access it. You can simply download OLX app and start using it from your mobile phone. The app is available for both Android and iOS (iPhone and iPad). 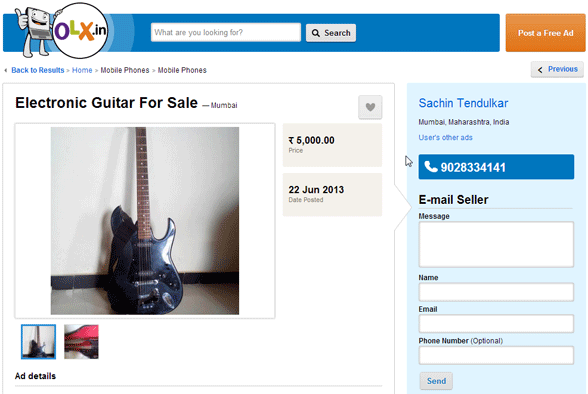 Buying products online on OLX is very easy. Simply visit the OLX website from your computer, smartphone or a tablet and search for what you want. You will see all the available related products for sale. You can then contact the seller immediately by calling him over the phone or sending an email to him from the listing page. If you are on a computer, then to sell products online on OLX, click on ‘Post a Free Ad’ link in the top right corner of the OLX website. Select the appropriate category and sub category for your product, fill out some information about it like description, price etc. and publish the listing. You will start getting enquires within minutes! If you are using the OLX mobile app, then simply take a snap of the product you want to sell using this app, include some description, price and contact details and you are done. The app automatically determines and updates the location of the mobile, although you can update it if the product is not located somewhere else. Once you have listed a product to sell online, you can also share it on social media sites including Facebook and Twitter for maximum exposure of your products. May be someone from your friend list on Facebook is looking for what you are selling! OLX is truly amazing and easy to use. Give it a try!